Who wouldn’t love to get one of these gorgeous invitations in the mail?! As wedding photographers, we can always see the couple’s dedication in all of the wedding details that they choose. This creative bride went above and beyond with custom invitations that she designed herself! We love to see couples getting involved with their wedding planning process, and it truly shows in the finished product. The soft pink of the envelopes matches the color scheme of the wedding, but the thin lines of embossed gold details add another element of intricate beauty. 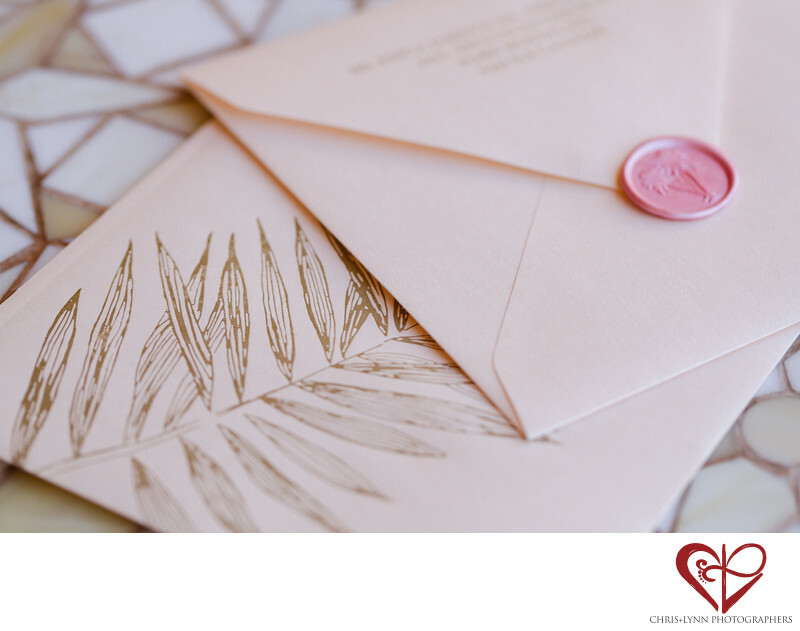 We also love the pink stamp with the two palm trees - this detail adds an old-fashioned flare to the invitations and plays on the tropical feel of a wedding in the paradise that is Cabo San Lucas! By sealing the envelopes with real stamps, the invitations are even more personal. This close-up shot gives these invitation envelopes all of the attention they deserve. 1/800; f/4.0; ISO 400; 100.0 mm.